"So the people...believed God, and proclaimed a fast, and put on sackcloth, from the greatest of them even to the least of them." I started writing this post days ago, and my, how things have changed since I began writing it. My heart is so overwhelmed that I can barely finish it. Before I get into the rest of this post, I want to say that today is dear Zach's birthday! bringing with him the sweetest bursts of sunshine ever to enter our lives. Unbelievable to see how quickly the years have flown, and I cannot believe our "baby" is now 17. Being the one he calls, "Mama", is truly one of the greatest, most precious joys, gifts, and blessings I have ever been given. I cherish every, single moment with this dear boy, and I will never cease praising God for allowing Kevin and me to be his parents. Today, we were eating at one of Zach's favorite restaurants and enjoying the special treat of getting to go there on such a special occasion, when Kevin's cell phone rang. It was my nephew, Mark. I knew when I picked up the phone that something was tragically wrong. The flood of tears and each near-unintelligible word that followed felt like an individual dart shot straight into my heart. "We lost him, Aunt Cheryl", I finally deciphered Mark's words between sobs. "What do you mean, Buddy?" I did NOT want to even imagine I had heard him right. The one you have prayed for so earnestly and for whom I called the day of fasting and prayer for tomorrow, 12/27, is now resting in the arms of Jesus. My tears flow like a river, as I try to see the screen while typing these words. LD left this world this morning at around the same time dear Zach entered it 17 years ago today. I won't say I come close to understanding God's plan. This is not the way this was supposed to turn not...not even close....in my way of thinking and realm of thoughts. God's thoughts are so far above mine that the two do not, nor can they ever, be reconciled. After I got the word out about the day of fasting and prayer, responses began to flow into our email. Responses from people who are hurting. Who have loved ones who are hurting. Tomorrow, is the day we set aside to call for a time of collective fasting and earnest prayer on behalf of my brother-in-law, LD, who has been battling stage 4 lung cancer. I originally thought this time of intercession was to be set aside, just for LD. God, obviously knew all along, that by 12/27/17, LD would no longer need our prayers. a time to pray and seek God's face with the intense earnestness it takes to move Him on His throne. There are situations in this life that require a greater level of intercession and desperation before God, such as was the case in LD's situation, and many others. Fasting does not mean that you have to go without eating for a full day. Many people have health issues that prohibit this. Even the sacrifice of one meal or the setting aside of something for the sake of obedience accelerates the power of prayer. Now, instead of praying for my dear brother-in-law, who has just today received his perfect healing in Heaven, will you please, please pray for my sister, Debbie, and my nephew, Mark? In the moments you would have mentioned his name, will you please kindly mention theirs? All of our hearts are shattered. We had so much faith to believe things would turn out the way we wanted them to. To be honest, we are just consumed with grief...we cannot understand. We all prayed SO hard, and dear LD had SO much faith. We all just knew this would turn out differently, and we all feel like we were just slapped in the face and punched in the gut. God sent the healing we asked for...just not in the way we had hoped. 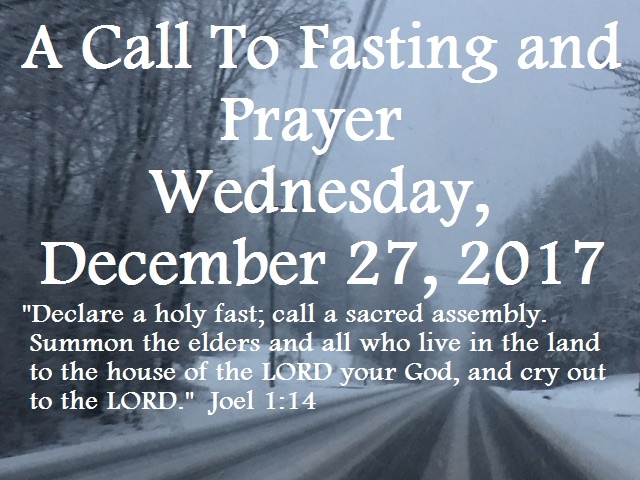 In addition to praying for my family tomorrow, will you also please pray for the others who have sent prayer requests that would so appreciate being included in this special time of prayer and fasting? I list the prayer requests below, in the order they came to me. Please pray for fellow-blogger, Betsy Queen's, brother-in-law, Mike. I share her words here. "He has three cancerous tumors in his lungs. The anti-rejection medicine he has to take from his liver transplant causes these cancerous tumors. It’s truly a “pick your own poison” situation he’s in. Without the medication, his body will reject the liver. With the medication he gets cancer. He has treatments three times a week at the hospital, and it’s very draining for him and my sister. It’s been a years long battle so far and it is draining them." Please pray for fellow-blogger, Mary Zatkalik, who recently had to have both knees replaced and is now going through a painful, difficult recovery. UPDATE: 12/27/2017 @10:01 PM - Please also pray for God to heal a chest cold that Mary is suffering from. Kevin's Aunt Vaida Waid is very ill, battling lung cancer for the 2nd time. (You may remember me mentioning prayer for her last summer, when I spoke of her illness in this post.) The type of chemo they are giving her this time around has wreaked havoc on her body, and she is being forced to decline further treatment. Please pray for her healing. Doug and Rose, both stand in need of physical healing, they long to draw closer to the Lord and to put Him first in their lives, and their home needs a new roof. Please pray for fellow-blogger, Bettie G., who suffers terribly from physical afflictions and has just undergone a change in medical treatment. She shared this, "Would you pray that this new medication will not cause side effects while we have family gatherings here? I want to be "present" and full of the Holy Spirit's grace during our visits." Please pray for Louise, who is suffering from bone cancer and has been sent home from the hospital with little hope. UPDATE: 12/27/2017 @ 9:15 PM - I just got word that Louise just passed away. Please pray for this dear, grieving family. Please pray for Minnie, who has suffered a stroke and is not doing well. Please pray for the parents and family of 10 month old, Eden, who recently died after suffering a rare brain aneurysm. Please pray for a miracle for a mother and her 4 children who are in dire circumstances and sent this request for prayer, "My children and I ask for financial security, safety, and God to do miracles for us. There is so much we need. I ask for miracles to never be apart from my children." Please pray for a wife who sent this prayer request for her husband, "Would you uphold my dear beloved - we’ve been married for 39 years and I’ve been praying for his salvation for 37 1/2 yrs. Would you pray that the Holy Spirit would continue to work on his heart and woo him to Jesus. Our lives and days grow shorter, and I desire to share my Jesus with him." Please pray for Bronda Boley, who is heavily burdened and sent this request, "There are so many things on my heart right now..." Sometimes, we cannot even put into words what we need. So thankful to know that Jesus knows! Please pray for a two-year old with respiratory distress. Please pray for Scot, a young man who is battling stage 4 cancer. Please pray for a brother-in-law, named Roy, who is in hospice "who wants to go to heaven--"home". Please pray for Lemeno Pearsall, who is suffering from pneumonia and congestive heart failure. Please pray for her daughter, MG, who has to travel a long distance to be with her. Pray for safe travel and peace of mind and heart. Please pray for 38 year old, Monica Brown, who is suffering from a rare, cancerous blood disorder. She has been on life support for a month and is not doing well. Please pray for a teenage boy named Parker. Please pray for fellow-blogger, Kitty, and for healing hearts in her family. Several have silent prayer requests that they would prefer to keep private. Please cover all of these with a blanket of intercession tomorrow, along with the names you are mentioning, if you will, dear friends. God knows who needs your prayers, and He sees and knows every individual heartache....yours, included. He hears and understands the words the heart speaks. Your prayers and the sacrifice you are making to join in this fast mean more to me than I could ever express in mere words. and may He work out your own personal prayer requests and meet every need in your lives at this time. "Now unto Him that is able to do exceeding abundantly above all that we ask or think, according to the power that worketh in us..."
"And Jesus answering saith unto them, Have faith in God." So sorry for your loss, Cheryl. Praying for the family and each of these requests. Thank you so much, Wanda. Your faithfulness to pray is such a dear blessing to me. Sending love to you, sweet sister. Dear Janice, Your words were such a blessing and encouragement to my heart tonight. I am SO sorry you lost your dear mama. I surely know how that feels...my dear Mom went home to be with Jesus 5 years ago, and it just leaves a deep, aching void within. It is so sweet of you to write out a list of the people who need prayer. Oh, I SO appreciate your prayers for my family and me, too. You are a dear blessing, and I send much love and gratitude to you tonight. May God comfort you when you miss your mama, too. My dear Cheryl. I cry for the pain and devastation your family feels after losing L.D. to cancer. That word. Cancer. May I just say that I despise that word? From our emails to each other you know that although we feel such terrible pain when a loved one passes, their burdens are gone and rejoicing is in Heaven when a brother or sister goes home when that person is a believer as L.D. was. My heart is burdened for you and your sweet family, especially Debbie and Mark. I am fasting as much as possible today. Because of medications I can't do a complete fast, but I can limit what I intake and that I will definitely do. Thank you for including my brother-in-law Mike in your prayer list today. I will be praying for all on your post. May God bless you abundantly that even in your pain, you are thinking of others in need. Blessings always my sweet Cheryl. Dear, sweet friend, I despise that awful word, too. You will never know how much we all appreciate you, dear Betsy, and your precious prayers and support and encouragement. Thank you so much for joining in the fast today and for the love you show always. Sending much love and gratitude to you, my dear faithful friend. I am praying for you, too. Dearest Cheryl, My heart goes out to you, Debbie and Mark as well as other family members in the grief everyone is experiencing after having L.D. 's passing from this world to heaven. Although this wasn't the healing you all were praying for, he was healed completely. Praying for you all as well as the needs above. It ended up my beloved saw the email after all; he is in God's hands and the Lord will take care of this. Dear, precious Noreen! Thank you from the bottom of my heart for your prayers for us! Oh, there are no words to express my gratitude. Today has been rough. Sometimes the tears just will not stop, as the realization of the loss overwhelms us. I don't know what we would do without Jesus, especially in times like these. Oh, dear friend! I am SO sorry about that email being seen!!! Oh, dear Lord, have mercy and please work this all out. All I can think of is the fact that "God doeth all things well", and perhaps, there is a reason, but, I just hate that you may be having to deal with hard things because of it. I am surely praying and trust God will have mercy. Sending much love to you. I am so sorry. You and your dear family are in my prayers, Cheryl. I know Debbie and Mark need our prayers so very much. I would love to be included in the day of fast and prayer, for healing hearts in my family. Oh, sweet friend! You will never know how much they need your prayers! The grief is unbearable. I went on and added your name to the list for prayer. I am so sorry it took me so long to see your email to add it, but I will leave it up for a few days, and I trust many will see the request and pray. Sending much love to you, and praying often for you and your burdens. It is hard to understand the Lord's ways sometimes but I rejoice that LD has received the ultimate healing. I'm praying that the love of God surrounds Debbie and Mark and helps them in their grief. I am praying for each one listed here in this prayer meeting and storming the heavens for their requests. Thanks for prayers for me. I caught a nasty chest cold and can't do much. But I can pray! Love you, Cheryl and your beautiful heart. Oh, your faithfulness to pray is just SO appreciated, dear Mary. I am so grateful to you. I love the way you worded that about storming the heavens. We need more prayer warriors like you, sweet friend, who will take the burdens of others and make them your own. I am SO sorry to know that you have a chest cold. Oh, bless your heart! On top of all else you are going through. May God have mercy and send healing to you soon. I am going to go on and add the request to pray for this, too. Love you so much and appreciate you. Thank you from the bottom of my heart, dear Debby, for your loving support, understanding, and your faithful prayers. We appreciate it much more than words can express! I know you know how hard this all is, and I am thinking of you and praying for you, too. May God comfort you in every moment of grief. Sending much love back to you, sweet friend. Thinking of you and your family today. Had a wonderful season of prayer this morning, lifting all the requests in this post. Will continue to lift these needs to the Lord in the coming days and weeks. May shalom---peace, healing, wholeness, comfort---be yours now and always. Thank you again for allowing us to share our requests, and allowing us the privilege of helping bear the burdens of our brothers and sisters in Christ. Grace and peace be yours through Christ Jesus our Lord. Dear, sweet Bronda! I can just imagine your time this morning in prayer, at Jesus' feet, lifting the requests in this post! You will never know how much I appreciate your faithfulness to pray and lend such support and love to the ones who need it. Thank you for your kind words. God bless you abundantly, my friend. Dear Cheryl, My heart breaks with yours. You and your family have been heavy on my mind and continually lifted up in prayer. Thank you again for setting aside this day to fast and pray. It will be a privilege to sit before the Throne of Grace to lift these petitions forward, one by one. Sending you much love and comfort. Precious friend! Thank you from the bottom of my heart for your prayers and for your faithfulness to remember our needs. Today has been so hard. The reality is sinking in, and we are all very overwhelmed. LD was just such a strong person that we all thought would always be a part of our family and lives. He was there for so many of us. He has been such a source of spiritual guidance, and now he is gone. I know he lives on in Glory, but, my, the hole that is in our hearts here is just near-inconsolable. Love you so much, sweet friend, and SO thankful for you. SuAnn, Dear friend, you are a constant source of encouragement to me, and I am SO grateful for you and your prayers, kind words, and friendship. YES, let's keep believing together that we will see His good in the land of the living! I hadn't thought of that verse in a long time, and I so appreciate that reminder. I will cling to that! Psalm 27:13, "I would have despaired unless I had believed that I would see the goodness of the LORD In the land of the living." (NASB) LOVE that verse! Wow! Thank you so much! Sending love to you and praying for you often, sweet friend. I'm so sorry to read about the loss of your brother-in-law and I'm praying for you and your family during this very difficult time. Praying that God will flood your heart with his comfort and love and meet you in ways that are beyond anything you might expect. Thank you from the bottom of my heart for your prayers and loving support, dear Valerie! I am so grateful to God for you and the steady source of encouragement you are to my life. I am praying much for you, too, sweet friend and hope all is well with you. God bless you abundantly! Sending love and hugs your way! Thank you ever so much, Regina! I so appreciate your prayers and comforting presence. May the dear Lord bless you, my friend! What precious encouragement, dear Nancy! In all honesty, this year has been one of the hardest any of us can remember, and your kind words have been a blessing to me time after time. Thank you for your faithful friendship and support and prayers. It means more than I can say! God bless you abundantly, sweet friend. I am sorry for your loss. My prayers are with you! Thank you, Michael! It was such a comfort to find your comment and read your words. Your prayers are so appreciated. God bless you! I am so sorry for the loss that you and your family must bear now. I will continue to pray and ask the Lord to cover you with His wings, and bring the comfort that only He can bring! I am also still praying for this list you have included here, and so many hearts who need His touch! Thank you so much for sharing this connecting place for us to lift each other to Jesus! Love and Hugs to you! Thank you ever so much, dear Bettie! Your emails and loving comfort have meant the world to me through such trials. I am so grateful for your friendship and support and prayers, and I want you to know that I am surely praying for you, too, my friend. Sending much love to you today!